Barbara Rudolph Fine Art: Contemporary Icon Painting "Golden Graces"
Contemporary Icon Painting "Golden Graces"
Yesterday there was a local artists show that was held at Unity Church in Phoenix. Someone recently told me about it and I decided to put a few paintings in the show. There were a large amount of entries and quite a variety of talents from painters to sculptors and photographers. It was fun too see all the various works as well as to meet so many nice people. 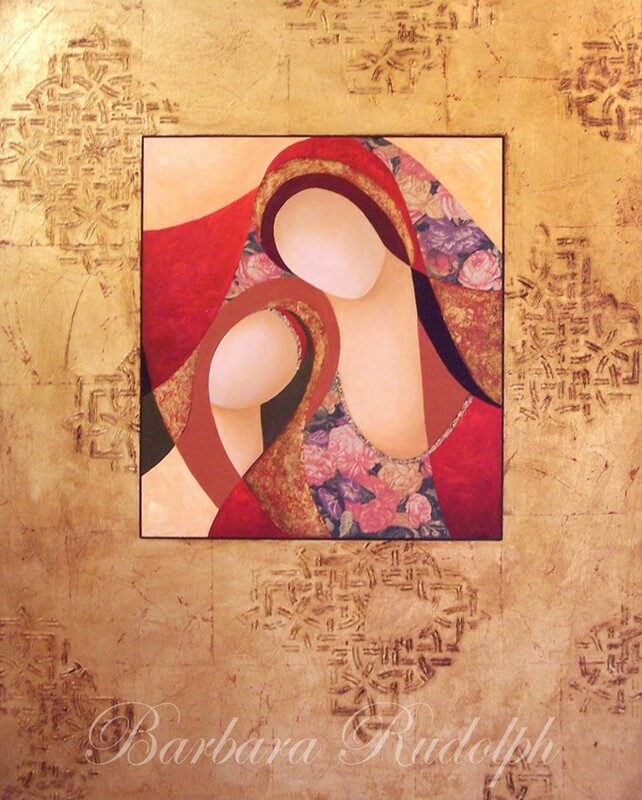 This painting "Golden Graces" was from a series of mine I painted a few years back called "Contemporary Icons." I initially had it on display at the Herberger Theater art gallery down town for an exhibition titled "Worlds In Common." I was going to send "Golden Graces" up to my gallery in Tucson but I decided to put it in the Unity show this weekend first. I delivered it to the clients home today for a trial. She purchased it and I think I must have actually painted it for the room it is now hanging in. It was a perfect fit on her beautiful sage green wall. It is always a pleasure to get to meet the people that buy my art and really fun to see where the painting will be hanging. Thank you to all of the people out there that appreciate original fine art. "Golden Graces" took many hours and many layers of paint and gold to complete. Each step was painted one section at a time after the gold leaf border had been created. Now I get to go back to painting my latest series that includes "birds." Bird Painting finished "Summers End"
Beginning A Painting "The First Steps"
Art Gallery Season "Kick Off"